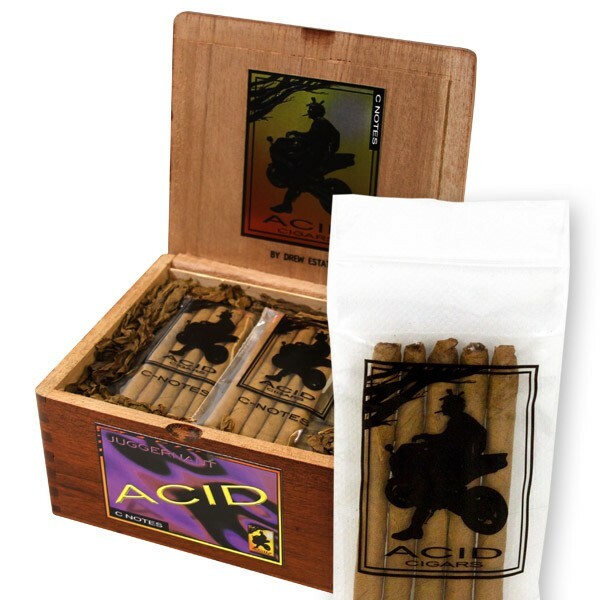 Acid has been know to push the envelope when it comes to new cigars - one of the companies slogans "The Rebirth of Cigars" is no misleading comment. Continuing with this increasing notoritiety - Acid has released the "C-Note" - a natural, handmade cigarillo that was created to bring attention as well as flavor, to the smoker. Each box contains 20 baggies of 5 separate cigarillos for a total of 100 fantastic little cigars. Lets see how these mini cigars perform! While one would think "with a cigar this small, how hard could it be to make" - consistecy and rolling expertise is still needed for these cigarillos. While they have a bit more give than a larger ( 50 ring or larger ) premium cigar, they do not feel soft or underfilled by any stretch. The foot lit easily and produced a moderate amount of smoke from start to finish. What else can you ask for?! One can easily expect a cigar of this size to primarily be one dimensional - Acid has actually produced a small cigar that carried dynamics that many on the market just cannot reproduce. Floral notes run the background with sweet yet spicey hints coming and going through the 20 minute experience. Like they said - quite an experience. Eventhough I am not one who would normally smoke cigarillo - I find that on occasion they are exceptional and for a 'quick fix' they do the job in flying colors. 100 cigarillos will go quick so make sure you stock up on them now and then add a price that only Buy Discount Cigars can offer and you have a sure winner here!